This is the story of how a simple question led to a couple selfless acts, a cool interaction with a superstar prospect and a couple of very happy collectors. 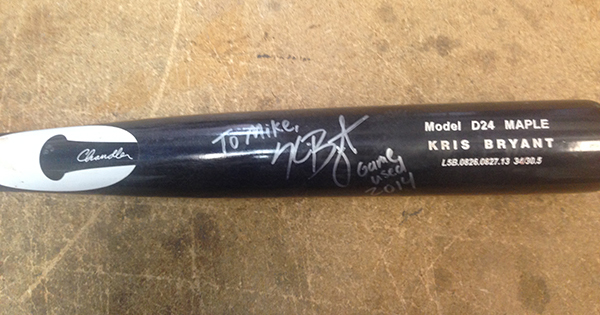 Last week, Mike Kennedy (or Mike in Vegas as he's known on Twitter) was looking at adding a game-used Kris Bryant bat to his collection. Seeing as how the price tag was $850, Kennedy, an Angels fan, did his homework to check its authenticity. He went right to the source, Kris Bryant, himself, via Twitter. It was an innocent request just looking to leverage social media for a response. And respond Bryant did. "I was in shock. Here is the Baseball America MiLB Player of the Year, the 2014MiLB Home Run King, baseball's number one prospect and he's just giving me one of his bats. I couldn't believe it," Kennedy said. "I've been a big fan since he was drafted and had several of his autograph cards. I had heard stories from friends on Twitter that he was super nice and really fan friendly but you never expect something like that. So this just made me appreciate him more and made me a Cubs fan." Bryant followed through on his promise. Kennedy received an inscribed bat yesterday. Given the public nature of the exchange, the story made the rounds in several mainstream places including the Chicago Sun-Times, Yahoo!, Sports Illustrated and MLB.com. But what they didn't note is that Kennedy made a huge gesture to another collector as a result of his interaction with Bryant. He sent Ivan Lovegren, a huge fan of the prospect, the card he's been chasing all season -- a 2014 Bowman Chrome Kris Bryant autograph, arguably the biggest baseball card of the year. "When Kris gave me the bat and wouldn't take anything in return I thought the best thing was to just pay it forward," said Kennedy. "Ivan is a huge Bryant fan. He had recently changed jobs to further his career and go after his dream. That meant cutting back on cards and even selling one of his prized Kris Bryant autographs. As a Cubs fan, that's just brutal. I've been there I know it's like to start over and have to curb your spending." As fate would have it, Lovegren got his card the same day Kennedy got his bat. "I'm just humbled and so blessed by it. I was driving when I saw his original tweet and actually had to pull over on the freeway it hit me so hard," Lovegren said. "That's the one card I've been trying for all year." Lovegren, one of the creators of the online hobby series, The Breaks, even went as far as creating an episode inspired by his unsuccessful chase of the card. The beauty of this story isn't that a collector got a free Kris Bryant bat. It's the good that came of it. The whole thing started with a simple request, not for an item but information and a couple of seconds of their time. By going that extra step, Bryant has not only made a bigger fan out of Kennedy but of lots of others as well who have caught the exchange. "Twitter can be very nasty and negative. I saw a player for the Angels quit Twitter because of all the negativity," notes Kennedy. "These things don't happen everyday and it was really unexpected. I think people take for granted what a amazing thing it is just to interact with a player. Jim Abbott was my childhood hero as a kid. If I could have talked to him then I'd have lost my mind. People now get mad or angry if players don't respond. Or trash them for bad play. It's insane to me. It's a blessing we have this now. If a player likes or replies to something you say, be happy don't expect something more." That is pretty cool of Bryant to do that. Congrats on the dude who got the bat, very jealous! 2014 Bowman Chrome Kris Bryant Prospect Autograph RC Rookie Cubs PSA 10 LOW POP! 2014 BOWMAN CHROME # KB KRIS BRYANT AUTO PSA 10 GEM MINT Nice!